Pantone inks ensure that business cards perfectly reflect your brand. 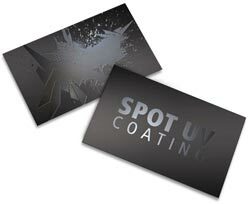 Spot UV gives cards dazzling effects that you can't get with ordinary printing processes. Spot UV isn't really "ink" at all. It's a special glossy varnish that's applied to business cards and instantly cured with ultraviolet light. The result is a shimmering glow that will make people wonder where you got such cool cards. Pantone inks are based on the Pantone color system (also known as the Pantone Matching System or PMS), which provides color consistency across everything your company does through multiple vendors. When you choose spot Pantone inks, you guarantee that the blue on your business card is the same as the blue on your signs and product packaging, making your brand recognizable by its color alone. Use matte paper to emphasize the shine of spot UV. For maximum shimmer, we recommend "silk spot UV" — coating the paper with a soft touch coating before adding UV coating. Keep your business cards uncluttered and make it easy for people to read your contact information. Use at least 8pt type and pick a typeface that's professional, clear and readable. Save the swirly scripts and comic sans for another use. Refer to your company's style guidelines when using Pantone inks to ensure you specify the right colors for your brand. These days, almost everyone can instantly enter contact information in their phones. But business cards still serve an important function. They give people a physical reminder that they met you. When you hand someone a business card, you keep the focus on your conversation, not on technology. And business cards keep working for you, even when there's no internet. Optional information includes your street address, social networking URLs and a QR code that connects to your company website. Include these items only if they seem useful and important to the people you meet. Your overall business card design should be consistent with your brand and the way you want people to view your company. Spot Pantone colors make it easy to maintain brand consistency, but business cards can also suggest your brand in more subtle ways. Thicker paper says "quality," while die cuts can make you seem creative and fun. 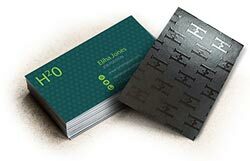 Spot UV gives business cards a truly striking look. Use a spot UV finish on the back of the card to transform it into a conversation-worthy piece. Or put spot UV over your company name or logo. Use spot UV to simulate water and other shiny surfaces, or to show that your tech company really is cutting-edge. Having trouble picking colors? Every year, Pantone names a color of the year and suggests other shades that pair well with it. Use spot Pantone color in this year's hue to create a business card that's perfectly on trend. 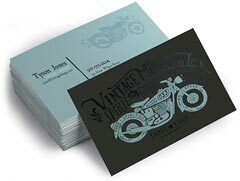 Spot UV gives business cards an arresting effect, while spot Pantone inks create colorful perfection. Either will give you the kind of business cards that you can't wait to share. Have questions about using Pantone or Spot UV?